Staging is officially over! Well, almost! Tomorrow morning, we will gather and board a plane for Belize. We will spend a night in Belmopan, and then live with a host famiy in a nearby village for 2 1/2 weeks. We will attend training, all learn some basic Kriol, and get to know Belize. Next will be Community Based Training, where we will be living with another host family, and attending training specific to our assignmnet and region. Communication may be limited during this time, but remember, "NO NEWS IS GOOD NEWS!" We will do our best to keep you updated. After a day of travel, we've made it to Peace Corps Staging in Miami, FL. We are now officially Peace Corps Trainees, again. Staging involves preparation to begin service, and we have joined over 30 individuals, from all over the United States, who are all headed to Belize. This afternoon we discussed basic Peace Corps Policies, as well as Peace Corps' Approach to Development and Safety and Security. The information has been the same as our last Staging for Kiribati, but it has been great getting to know the people we will be living and working with for the next 2 years. We have had some good rain, and we even had an unexpected break, when we were evacuated due to a fire alarm. We traveled down 20 flights of stairs and waited patiently for the Fire Department to check things out. It ended up being a false alarm. Just another reminder that when serving in the Peace Corps you must be flexible and ready for anything. Staging is over. It has been a great opportunity to hang out with our fellow Peace Corps Trainees. 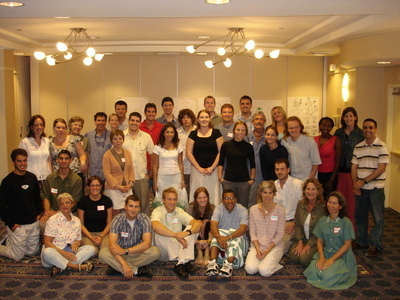 Our Staging Trainer, Kathy, went through the basics of Peace Corps. We discussed Peace Corp policies, managing risks, coping with unwanted attention, cross cultural adjustments, and safety and security. We discussed our aspirations and anxieties as well as the goals of Peace Corps and sustainable development. The best part has been trying to come up with songs to sing. At our welcome dinner in Kiribati, we will have to sing 3 songs as a group. Being in tune is plus, as are hand motions. We are all pretty nervvous about this, but plan on practicing before the big day. Skidamarink, Hokey Pokey, Twinkle Twinkle, and a Fly song are some of our options so far. We will let you know how it goes. We are now in LAX waiting for our flight to Nadi, Fiji. The flight is about 11 hours. Fiji, as well as Kiribati, is 18 hours ahead of Texas time, so as we wrote earlier, we lose a day and get there on Wednesday. As our journey gets going communication will be very limited. Our blog will be updated through snail mail. Remember.....NO NEWS IS GOOD NEWS.